And "first blood" for my Ruger .45 Colt restoration. Saw this critter creeping along my fence line. I was able to sneak to within 25 yards without him seeing me and get into a steady position. A cast 255-grain RNFP at 850 fps did the rest. If you look real close, you might be able to see the entrance wound right above the rear sight. The exit isn't suitable for a family-friendly forum. Hope the year continues like this! Nice chunky chuck. Good going. Is a .45 LC enough gun for such a nasty creature? And sneaking till within 25 yards? At that distance they'll hear the cracking of my bones when they are not freshly oiled. Good shooting there, never got that close to a live one!! 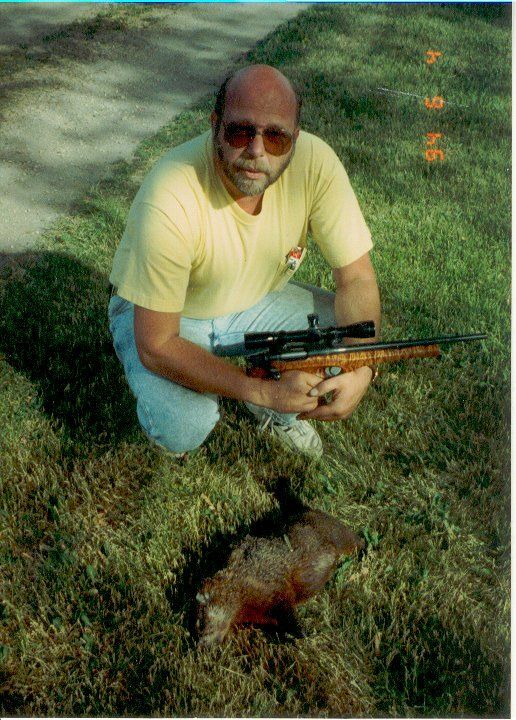 that is one BIG woodchuck!! Congrats, SSL! very nice. that ruger looks fine too, good on you for getting it out and using it so much more of a challenge than a rifle. Nice going SSL...a magnificent pistol, in a great calibre, with a terrific shot mate. 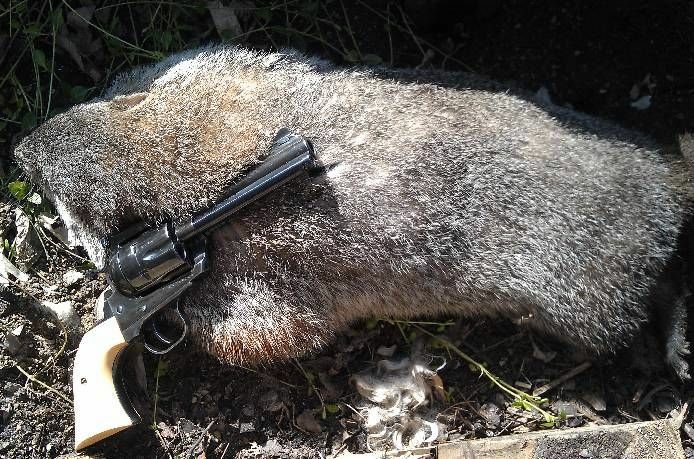 Never seen a groundhog, so I am assuming from what the others say that it is a big one and that you did good getting to within 25 yards of the bugger...well done mate. Slimjim and Vince bring up an interesting point about the size of the critter. I lived and hunted in SW Michigan for 18 years and now I'm in South Carolina and the difference in the size of the wildlife is interesting. Deer in Michigan were twice as big in general as they are here, and squirrels 2 to 3 times larger then here. Haven't ever seen a SC chuck so nothing to compare there. Has anyone else noticed the size difference? I'm an equal opportunity 'chuck shooter...I usually use one of my .17 Remingtons. If it gets them off my property, I'd use a hand-grenade! The story behind this one is that there has been an abandoned house across the road and down a hundred yards or so from my place. It has been empty for probably 20 years and the critters (skunks, opossums, groundhogs and racoons are simply over-running the place. Now they are trying to find more space and unfortunately I'm it. I'm pretty sure this groundhog is the one I have been watching grow bigger every year for the last 4 years. He has always been too smart to let me get a shot and I usually only see him when the season is closed. I'm guessing that the sudden bit of nice weather made him decide to do a little lady-groundhog hunting and his mind wasn't necessarily on survival. Come to think of it, I've known a few human males that description fits. Lester...I can't recall the name of the theory, but it proves that northern animals tend to grow bigger than those in southern zones as a heat-generating mechanism for the cold. What you noticed has basis in fact. theory goes something along the lines of... bigger animal has LESS surface area to body weight than a smaller one so it can stand more extremes in temp. One theory is referred to as "Bergmann's Rule", although there are several other schools of thought. That's the one I was trying to remember! Thanks! It's rough getting old. Nice shootin' by the way. I haven't seen any live whistlepigs yet this year, but did see a dead one along the road this week. Seems as though they like the warmth of the asphalt. I have 75 pieces of 22-250 brass ready to load for woodchucks, I just gotta clean the "winter accumulation" of the reloading bench. They're just starting to pop up here. Supposed to be close to 60 degrees next week, so I would imagine they will be out more. As long as that abandoned house stands I'm sure I'll keep having opportunities. As much as I like shooting them, an infestation is no fun. It has been a long battle trying not to let them take over my property. The guy who owns the property is actually a nice guy and encourages me to shoot them...but makes no effort to tear the house down. It has been a very long time. I actually had forgotten that I had this picture of another one I shot on his property from years back. Note the date stamp...1994! By then the house had already been empty for four years. I wonder if he would be adverse to having it removed??? the local fire brigade just love to have a controlled burn of a house it is great training for them.